I’ve taken to giving pop quizzes with easy answers…if you’ve read the material. 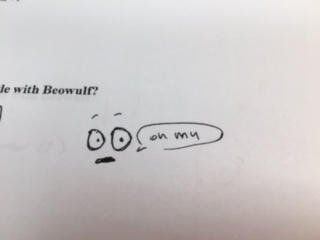 When I told my students they’d have one everyday as we went through Beowulf, they said, “Then it’s not a POP quiz.” So I starting calling them “Pop-Tart quizzes.” In any event, I always say, if you don’t know the answer, make me laugh–or draw a picture. 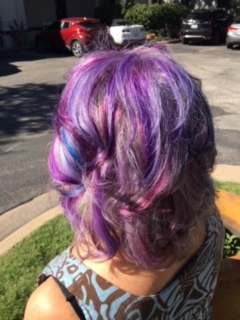 My students never fail me! Er…I don’t know the answer? What is or are NOT “an inexplicable blunder of taste”? It is an inexplicable blunder of taste to neglect the study of Beowulf in scholarly settings. 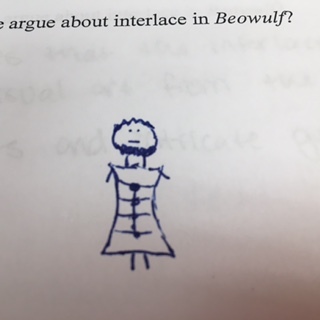 What does Leyerle argue about interlace in Beowulf? At least she was paying attention! What does Leyerle say about digressions in Beowulf? That one’s mind should not digress from remembering what Leyerle says about digressions. Why, according to Change, is Grendel’s Mother ‘monstrous’? Because she’s a strong independent woman who don’t need no man? 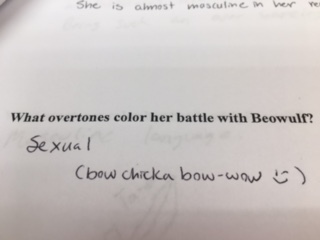 What overtones color her battle with Beowulf? Extra Credit: what is Euhemerism? I have no idea, but Robinson really likes to talk about it. I do not recall, but again, today’s outfit is REALLY cute. According to Roberta Frank, what is the ultimate point of Beowulf? To claim an ultimate point is to reduce the text into nothingness. Maybe I’m just trying to cover up my ignorance.